Often, when we think about the translation of the Book of Mormon, we immediately think of how Joseph Smith miraculously translated its Reformed Egyptian characters into English.1 This is certainly appropriate, considering that this event was one of the most miraculous occurrences of this dispensation.2 But translations of the Book of Mormon into other languages have also been miraculous, in their own small way. At least portions of the Book of Mormon have been translated into 111 languages, from Danish (1851), Welsh (1852) and Hawaiian (1855),3 to Pohnpeian, Sesotho, and Tshiluba, announced in 2017.4 Each translation has been a major effort of dedication, and many have been accompanied by miracles. The translation of the Book of Mormon from English into Ukrainian is one such small miracle in Church history. 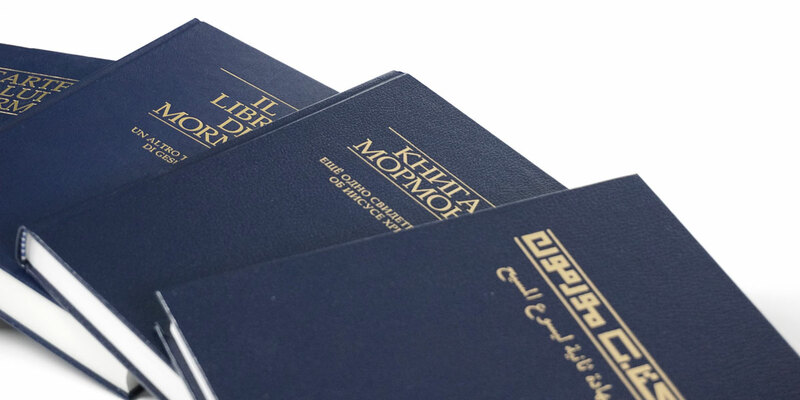 The Book of Mormon in different languages. Photograph by Jasmin G. Rappleye. We may feel overwhelmed and burned out and wonder how we can go on. However, Zoya’s story is a reminder that God has a habit of making things work out unexpectedly. It was just as President Biddulph and Elder Struk were praying desperately for someone to translate the Book of Mormon into Ukranian, perhaps wondering how they were ever going to find the right person, that Zoya was baptized. In the same way, Zoya finishing her translation of the Book of Mormon on time probably seemed impossible to her when she received the assignment. How could she possibly translate such a long and complex book while still working full-time to support her family? Yet, somehow, God blessed her with the ability to translate the book in record time, despite all the obstacles in her path and the burdens she would still have to bear. Just as God blessed Zoya and Alma’s people when they were bearing a heavy load, God will bless us when we put our trust in Him. Through God’s help, we can perform the seemingly impossible tasks we need to perform in life, and God can, through small miracles in our lives, help us do everything He has asked us to do. Howard L. Biddulph, The Morning Breaks: Stories of Conversion and Faith in the Former Soviet Union (Salt Lake City, UT: Deseret Book, 1996). Book of Mormon Central, “How Does the Lord Make Our Burdens Light? (Mosiah 24:15),” KnoWhy 102 (May 18, 2016). 1. See John W. Welch, “The Miraculous Timing of the Translation of the Book of Mormon,” in Opening the Heavens: Accounts of Divine Manifestations, 1820–1844, ed. John W. Welch, 2nd edition (Salt Lake City and Provo, UT: Deseret Book and BYU Press, 2017), 76–213. 3. See W. Jeffrey Marsh, “Brigham Young and the Book of Mormon,” Journal of Book of Mormon Studies 10, no. 2 (2002): 15. 4. See, “Church to Translate Scriptures in 34 More Languages; Will Release Portions Online,” October 10, 2017, online at lds.org. 5. Howard L. Biddulph, The Morning Breaks: Stories of Conversion and Faith in the Former Soviet Union (Salt Lake City, UT: Deseret Book, 1996), 1. 6. Biddulph, The Morning Breaks, 77. 7. Biddulph, The Morning Breaks, 74. 8. Biddulph, The Morning Breaks, 75. 9. Biddulph, The Morning Breaks, 75. 10. Biddulph, The Morning Breaks, 76. 11. Biddulph, The Morning Breaks, 77. 12. Biddulph, The Morning Breaks, 77. 13. Biddulph, The Morning Breaks, 77. 14. Biddulph, The Morning Breaks, 77. 15. Biddulph, The Morning Breaks, 77. 16. Biddulph, The Morning Breaks, 77. 17. Biddulph, The Morning Breaks, 77. 18. Biddulph, The Morning Breaks, 77. 19. Biddulph, The Morning Breaks, 77. 20. Biddulph, The Morning Breaks, 77. 21. Biddulph, The Morning Breaks, 77. 22. For more on how the Book of Mormon helped other early pioneers, see Book of Mormon Central, “What Did the Book of Mormon Teach the Early Saints about Enduring Persecution? (2 Nephi 26:8),” KnoWhy 339 (July 14, 2017). 23. For more on this topic, see Book of Mormon Central, “How Does the Lord Make Our Burdens Light? (Mosiah 24:15),” KnoWhy 102 (May 18, 2016). 24. For more in this idea, see David A. Bednar, “Bear Up Their Burdens with Ease,” Ensign (May 2014), 90.